From January 11 to March 8 Democrats living all over the world will participate in the Presidential Nominating Process of the Democratic Party, together with our fellow citizens living in the United States. 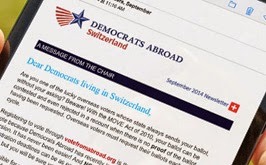 Democrats in Switzerland will have the choice of two voting centers: in Geneva on Super-Tuesday March 1st at the Warwick Hotel, or in Zurich on Saturday March 5th at the EMA House Hotel. Only the Democratic Party gives this opportunity to its members living overseas. Through our Global Presidential Primary, we will help choose the 2016 Democratic Nominee for President of the United States. The best way to participate in the Global Presidential Primary is by voting in-person at one of the dozens of official Voting Centers in more than 40 countries, during the week of March 1 to March 8.